Technology is still new enough so sometimes the connections seem to get strange. For example, here I sit at my computer reviewing a printed book. If you look at the book cover to the right you’ll see it seems to have a power cord, probably a cord for ear buds, a USB connector and another connector of some sort. 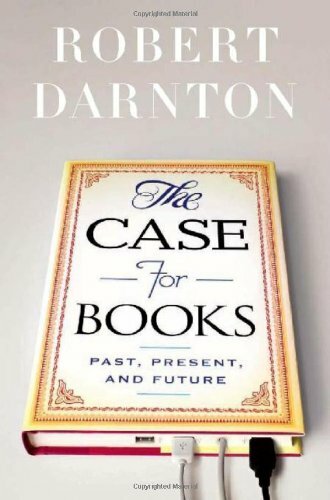 It is the cover for the wonderful book, The Case for Books: Past, Present, and Future. Those connections and the fact that the book is a real book in print complete with a hard cover in some ways capture what this delightful series of essays are all about. I wasn’t familiar with author Robert Darnton until this book landed in my lap – well sort of fell off the shelf at the library. I should have been. Although I didn’t find a website by him, google lists bunches of fascinating links. Perhaps it was his at working with various publishers, or his love of how books go together, from author to reader or even his stint as the director of the Harvard University Library that gives him the ability to think so deeply about books, or maybe it’s just who he is. Darnton loves the printed word. It might not be overstating it say he is in awe of it, or maybe I’m projecting. He’s also a clear and critical thinker. He’s not a bit sure the Google Book Search project is right or fair, even with the settlement. He asks questions I wish had been asked before the courts got involved. If I’m understanding him correctly, he’s warning that the potentially greatest library in the world will be owned by a corporation, Google and that means it’s held for stockholders rather than for the public good as most non-profit libraries are. That horse is out of the barn and it will be heck to pay to get it back if we decide we want to. The book, however, isn’t a political screed. There are wonderful stories of booksellers in the 1800s and publishers in the last century. I’ve come away with a deeper appreciation for books than ever before… even digital ones. Have you read The Case for Books: Past, Present, and Future? Do you want to? I must admit that when I read the title of your post that the subject was going to be about hardcopy books vs. digital. That could be because my brother-in-law and I were just discussing that topic this weekend. I definitely want to read Robert Darnton’s book. I was not tuned into all the particulars of the settlement with Google. I only knew of it on a peripheral basis. Thanks for the recommendation. .-= Cathy Miller´s last blog ..Health Care Tuesday Tackles Wellness ROI =-. Yeah, I read in bed too and in the bath, and at the beach… all places probably not great for ebook readers as they are constructed today.